Different industrial applications can have different requirements in terms of equipment and filter media. That's why we came up with our unique X100 Convertible Filter Housing. 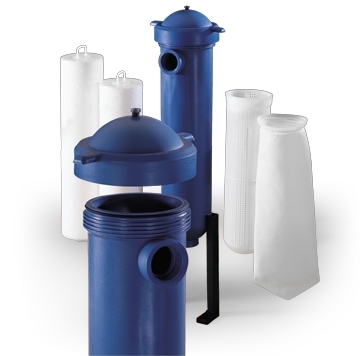 The strong, light weight and economical filter vessel is resistant to a wide range of chemicals, and converts easily from filter bag usage to cartridge filters. It allows the user to choose the filter media and construction to precisely fit their particular needs. The X100 is made from light weight polypropylene, with a UV inhibitor for all-weather durability. The specially designed, threaded lid allows for sealing and unsealing without the need of other tools. The New X100X3 holds 3 Standard 20" Cartridges.